I’ve been working on a serious post on seed legislation, GM crops and sustainability, but it’s going to take me a little longer to finish. I’m struggling to find time to research the issue thoroughly and I really want to make sure I’m properly informed. In the meantime, here’s something I wrote a little while ago and didn’t get around to posting. Hopefully I’ll have some science-based content ready for you soon! T.
Recently I realised, really properly realised, that my life is completely dependent on modern technological society. It’s something I’ve been aware of, to some extent, but it’s only now that it’s really clicked how total that dependency is. I’m not talking the small stuff, like how I derive my income, clothe myself and support my lifestyle. I’m not talking about the medium stuff, like my dependence on modern agriculture, transport, water and sanitation systems. Yes, if those systems collapsed right now I’d be in a lot of strife. Our society would fail and life would be extremely different and difficult, but it wouldn’t kill me. The loss of modern medicine? That would. I am medication-dependent. I have no thyroid gland. We killed mine, modern medicine and I, bombarding it with radiation until my ability to regulate my own metabolism was no more. There was nothing wrong with my thyroid, per se. We killed it because we couldn’t find a way to stop my immune system from attacking it, and with a rogue immune response on the rampage I was pretty sick and would eventually get terminally so or go into thyroid burn-out anyway. I am medication-dependent. My life depends on the technological-industrial machine. Somewhere they make synthetic thyroid hormone, press it into tablets and pack it into blister-packs of 100 doses. From that somewhere they ship it great distances to my local pharmacy, where it finds its way to me. They need to be refrigerated, my little life pills, as the hormone starts breaking down after two weeks at ambient temperatures. I am medication-dependent. I need access to a doctor who understands my ailment. I need routine blood tests to confirm my synthetic dose. I need international freight, aluminium blister packaging and refrigeration just to survive. That means I need the mining, mineral processing, manufacturing, petroleum, transport, refrigeration, pharmaceutical and health-care industries so that I can stay alive. I am completely dependent on the system, and that’s a very sobering thought indeed. If I go off-grid, I get sick and I die. How many of us are there? Every person with a thyroid condition, with insulin-dependent diabetes, with rheumatoid arthritis or one of hundreds of other non-terminal-if-treated conditions. Millions of us, all dependent on the technological-industrial complex to keep our bodies functioning, to stay alive. Today I was seriously thinking about my future, about where I want to go, what I want to do with this one precious shot at life. I want to change the world, but at the same time I have to live within it. I could choose to reject this modern technological society, to live outside it, truly sustainably and free, but to do so would, ironically, be choosing to die. A grim choice, indeed, but one I’m lucky to even be able to make because I had the good fortune to be born here, in the turn-of-the-century developed world. I got sick and modern medicine took care of me. For how many others is there no choice at all? No access to the life-saving interventions and drugs we rarely stop to consider? It’s making me stop and really think about what a human life is worth versus the value of our planet and the ecosystems that support the whole 7 billion (and rising) of us. Is it justified, this environmentally-costly medical intervention? I’m certainly very happy to be alive and in good health, and being aware of just how tenuous good health can be, has driven me to make the most of the time I have here, to try to leave the world in a better state, but is my life really worth it? Am I worth the sum of my impacts? Is caring for the sick environmentally sound? Whatever the answers, I know I’m incredibly privileged to be here, to have the machine on my side. 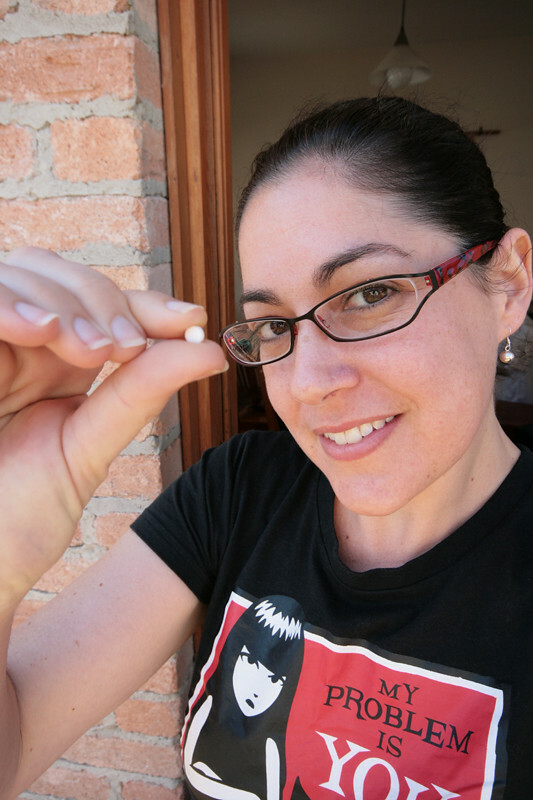 I’m forever grateful to my doctors and for everything that goes into these little white pills that keep me alive. I can’t opt out of the machine now, my life is tied to it, but I can choose what I do with this life. I’m lucky to be here, the least I can do is try to make the world a better place, not just for me, but for everyone. Ref seed legislation, I think the EU are just about to make some big changes but I have to read more myself so not sure of the implications, although I have heard that some of the heritage varieties may suffer as a result; it may be of interest to you. Hullo! It’s not getting updated as much as it should be at the moment, but thanks for reading! Great topic! Thanks for sharing that Toni. Well I used to be a registered nurse up until fairly recently and have thought about the environmental impact of hospitals on the environment quite a bit (excess water use, single use medical equipment being discarded, medical waste and medications going into waterways, electricity and so forth) but then I figured that wasn’t my job. My job was to look after sick people. Not environmentally, no, but ethically, yes. It’s possibly a moral dilemma but not a difficult one for me. In our society, if people become ill or injured, we look after them and I’ll always believe in that. Obviously it helps if the person is educated and thoughtful about their life choices, but that’s not always possible. Thanks for a thoughtful comment Emma. I agree, ethically, we have to care for our sick. I find it frustrating and guilt-inducing, however, that having access to the medical care I needed and the ongoing support I’ll require is due to an accident of birth: that I live in a rich, developed country with universal health care and access to services. I’m incredibly lucky because the resource lottery is in my favour, because I was born in tho the world of “haves”, able to consume resources at the expense of the “have nots” born in other places. Sobering stuff! Some research gives evidence that the rise in autoimmune diseases may be a consequence of modern hygeine and the shift in population of organisms that reside in our bodies. I recently interviewed author Moises Velasquez-Manoff about this topic. His book, An Epidemic of Absence, does not mention Grave’s disease, but finds parallel lines of research relating to many others such as m.s., celiac disease and type 1 diabetes. I would probably still be alive without anti-depressants and acid reducers, but it’s hard to imagine what the quality of my life would be. But again, these conditions interact with our way of life. It isn’t a simple one-way dependency. Graves, as best as they know, seems to be a genetic pre-disposition triggered by chronic stress. I do think modern lifestyles, diets and disconnects play a huge role in elevating stress levels and thus auto-immune diseases like Graves, and if I’d made some different choices in my 20’s, or even had better informed doctors and earlier diagnosis, my health and life would have taken very different directions.